Sodium lamps are used for the flower-phase of plant growth when the plants need lots of red spectrum light which these bulbs put out. You can use sodium bulbs for vegetative growth as well but a metal halide blue spectrum lamp would achieve dramatically better results. Metal-Halide bulbs are used for the veg-phase of plant growth. When in vegetative growth plants prefer blue spectrum light which these bulbs put out. For flower plants need red spectrum light which these bulbs do not put out. If you want to use metal-halide lighting to flower your plants you can only do so if you use it in conjunction with a sodium system. The benefit of metal-halide lamps is that plants do not stretch as much and instead remain very squat and grow more shoots. You can use your metal halide lamp for the first few weeks of the flowering cycle to stop them stretching even further. 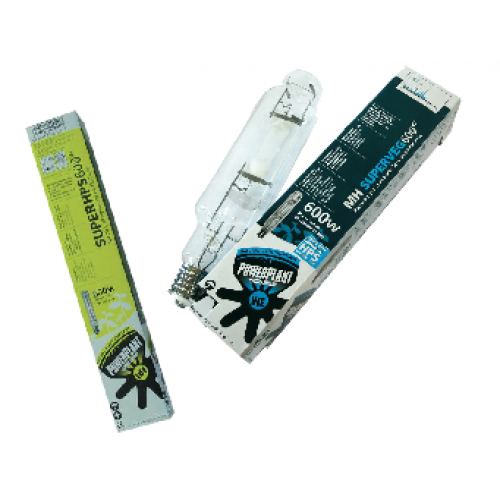 Metal halide bulbs run on the same equipment as your main sodium flowering light so all you need to do is swap the bulbs. Just remember that you can only use the same wattage as your sodium light though. Powerplant Metal Halide Grow LampsMetal-Halide bulbs are used for the veg-phase of plant growth. Whe..